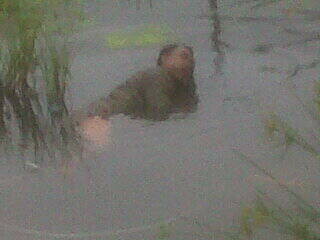 A Doornbach resident took this picture of the suspected thief lying in the Diep River after being badly beaten by vigilantes. A suspected thief was beaten and left for dead in the Diep River on Friday evening after a construction foreman was robbed of R55 000 worth of wages he had drawn to pay employees. Residents who took part in the beating refused to be named for fear of being brought to book by cops. They said two men robbed a foreman working for a construction company fixing roads in the informal settlement and stole R55 000 of labourers wages. Although they fled in different directions, labourers managed to catch one suspect and beat him. Pictures on popular mobile messaging platform Whatsapp show the suspect badly beaten and lying in shallow water in the Diep River running alongside the doornbach informal settlement. The residents used golf sticks, wooden planks and sharp objects to hit him, said eyewitnesses. The residents said when they asked the suspect his particulars he told then he is Mkhululi Mpontsha from Gugulethu’s B86 Barcelona informal settlement. Van Wyk said police responded to an assault complaint in Doornbach on Friday evening and upon arrival found a 34-year-old male in “a small dam, both legs tied with plastic rope, one leg broken, stab wounds to his head, face swollen and bruised”. He was apparently beaten up by the community as they believed he robbed someone, said van Wyk. He said the victim was taken to a nearby hospital for medical assistance and was still in hospital.